Google Calendar found a way to separate old events from upcoming events: old events are now grayed out. The interface also grays out future recurring events because it's likely that they're less important (this was an experimental feature in Google Calendar Labs). If you don't like the new features, it's easy to disable them: go to the "Options" menu from Google Calendar's navigation bar, select "Calendar settings", go to the "Event dimming" section and disable these two options: "Dim past events" and "Dim recurring future events". Google says that the brightness of these events is reduced "so you can focus on today", although you'll be able to better focus on the future, as well. This was always around in Labs! thanks the dimmed out past events were really annoying to me. Was searching around to find where to disable it! Much improved. Depending on monitor contract the previous version it was very hard to even tell where 'today' was in the calendar. With this update it's much more clear. Strangely, I had this option on my Calendar last week, but it suddenly disappeared from options! I really like dimming past days - it gives you a visual cue as to where you are. I've posted this as a suggestion to google a long time ago. If you don't what day it is without looking at google calendar how did you know what underwear to wear before google calendar dimming? I thought the idea here is to help each others, not to advertise your IQ. There is a huge bug on this implementation! 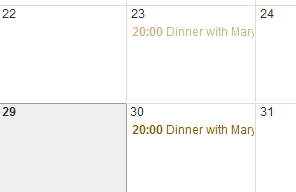 At leas on my calendar, I have a recurring event that happens every week. If I look at this event sometime in the next few months, it's ok: it's displayed dimmed. But once I get on the same month, but in a different year, it restarts the dimming from the beggining! I would prefer to have past events deleted from my calendar after archiving them in Gmail. That way I'd have an audit trail but not a cluttered calendar. Thanks for this post. I'm all for new features, but with one proviso, that the user retain the ability to turn it off or on, and customize it. My dimming feature stopped working too! Just noticed the dimming feature stopped working on my Google Calendar as well. It was fine only yesterday. Checking/Unchecking/Re-checking the option + restarting the browser did nothing. In the settings it says that dimming only works in day and week views. Does anybody know why this change? Stopped working for me too! Idiots at google can't leave well enough alone. Leave the dimming optional. My TODAY is now grayed out and I have no idea what is in there. Good grief do I have to go to yahoo calendar? Google, we know you hear us! SAAAAAVVVEEEE USSSSSSS!!!! We need a way to delete old events. Please speak to us!!! Hurrah I found the comment box! Lucky I did not have to go through a couple of thousand entry to get here! Jeez...This thing is 5 to 6 years old. Does this mean I'm the only one with that problem now!